As I prepare to watch a solid hour of The Alfred Hitchcock Show on Antenna TV, I am trying to sneak in a five minute interlude to listen to the song "Ghouls Galore" by Alan Hawkshaw, from the Monster Club Soundtrack. 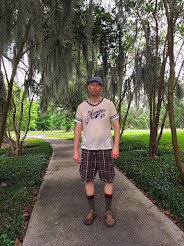 While you're here, could you do me a favor and take just a moment to bookmark my website, share it on Twitter, Facebook, wherever is easiest for you? A ghoul is a (folkloric) monster associated with graveyards and consuming human flesh, often classified as undead. The oldest surviving literature that mention ghouls is likely One Thousand and One Nights. The term was first used in English literature in 1786, in William Beckford's Orientalist novelVathek, which describes the ghūl of Arabian folklore. 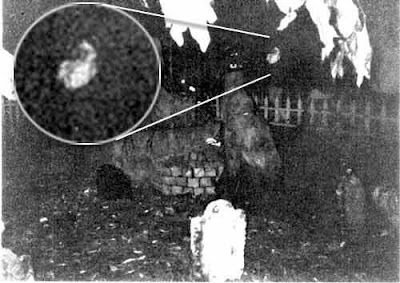 This is a photograph taken at a local cemetery purportedly documenting a ghoul robbing a grave. It's a very old photograph and I can't determine exactly what's happening here.